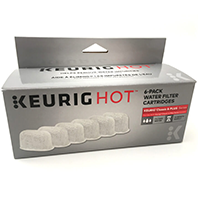 This Water Filter Cartridge Refill pack includes replacement filters for your Keurig® Water Filter Starter Kit accessory (sold separately). Simply place a cartridge into the Water Filter Assembly and insert into your water reservoir. For best results, replace your water filter cartridge every 2 months or 60 tank refills. Compatible with all Keurig water filter starter kits for classic and plus series (2.0) brewers. Not compatible with Keurig MINI Plus brewing systems. 2 Filters $8.99 Coming soon!